The SEM shows Molybdenum sulfide deposited at room temperature. 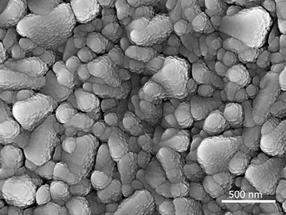 Experimental data show, how catalytically active nanoislands of MoS2 are formed. Efficient and inexpensive catalysts will be required for production of hydrogen from sunlight. Molybdenum sulphides are considered good candidates. A team at HZB has now explained what processes take place in molybdenum sulphides during catalysis and why amorphous molybdenum sulphide works best. Sunlight not only can be used to generate electricity, but also hydrogen. Hydrogen is a climate-neutral fuel that stores energy chemically and releases it again when needed, either directly via combustion (where only water is produced) or as electrical energy in a fuel cell. But to produce hydrogen from sunlight, catalysts are needed that accelerate the electrolytic splitting of water into oxygen and hydrogen. 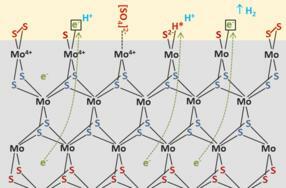 One particularly interesting class of catalysis materials for hydrogen generation are the molybdenum sulphides (MoSx). They are considerably cheaper than catalysts made of platinum or ruthenium. In a comprehensive study, a team led by Prof. Dr. Sebastian Fiechter at the HZB Institute for Solar Fuels has now produced and investigated a series of molybdenum sulphide layers. The samples were deposited at different temperatures on a substrate, from room temperature to 500 °C. The morphology and structure of the layers change with increasing deposition temperature (see transmission electron microscopy (TEM) images). While crystalline regions are formed at higher temperatures, molybdenum sulphide deposited at room temperature is amorphous. It is precisely this amorphous molybdenum sulphide deposited at room temperature that has the highest catalytic activity. 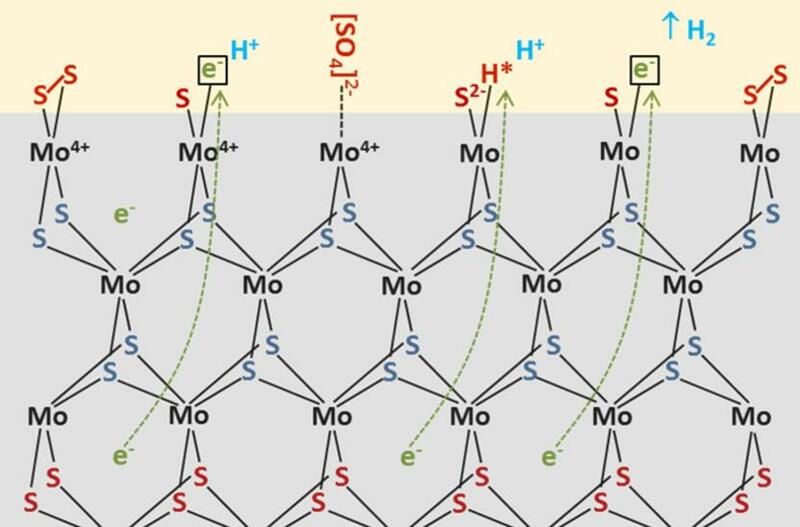 A catalyst made of amorphous molybdenum sulphide not only releases hydrogen during electrolysis of water, but also hydrogen sulphide gas in the initial phase. The sulphur for this had to come from the catalyst material itself, and astonishingly – this process improves the catalytic activity of the molybdenum sulphide considerably. Fiechter and his team have now taken a close look at this and are proposing an explanation for their findings. They investigated amorphous molybdenum sulphide samples used as catalysts in water splitting using various spectroscopic methods, including in situ Raman spectroscopy. These measurements show that nanocrystalline regions of molybdenum disulphide (MoS2) form over time in amorphous molybdenum sulphide samples as a result of sulphur escaping from molybdenum clusters. At the same time, less and less hydrogen sulphide is produced, so that hydrogen production becomes dominant. “We can deduce from the data that low-sulphur areas with islands of nanocrystalline MoS2 form as a result of the sulphur escaping. The islands act as catalytically active particles”, explains Fanxing Xi, who carried out the measurements as part of her doctoral work. “These insights can contribute to further improving the catalytic activity and stability of this promising catalyst for hydrogen generation in the water-splitting process, and coupling the material to an electrolyser operating solely on sunlight”, said Fiechter.